Some enlightened councils have set up ‘citizen juries’ in order to work on budget priorities each year. In Glen Eira there is no such thing. Residents get no say in how they would like their money spent. Thus year after year we find the lion’s share of expenditure going the same way – more fancy ‘redevelopment’ of open space instead of the purchase of additional open space. More and more staff (from 810 EFT last year to 829 EFT for 2018/19). More and more money going to ‘consultants’ and ‘contractors’, etc. Port Phillip – A pensioner rebate that will increase by 3.1 per cent to $165 in 2018/19. Scrooge would be proud. Council reckons we’ve got 11% pensioners. 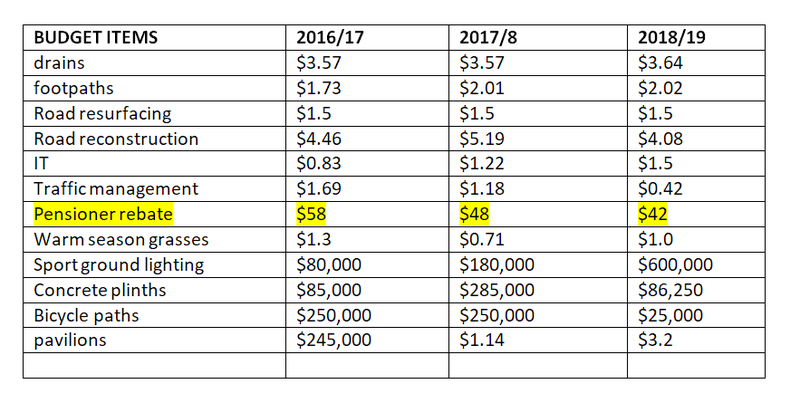 By my reckoning, out of 60000 properties council saves a miserly $40k by cutting $6. Yup a council that sure gives a damn about the elderly and others who need help. For all the talk about promoting cycling and walking as alternate forms of transport, $25k will sure achieve this. Crap budget, crap decisions, and crap council. Please correct me if I’m wrong on this. I think that since the open space strategy was introduced council has purchased precisely two properties only. One was a house for over $2m that they are renting out for god knows how many more years and another is a property in Carnegie that will not be touched for another decade. Meanwhile millions are being spent on pavilions, fancy playgrounds that the majority didn’t want (Harleston park) and grasses. I won’t even bother with the fortune spent on ugly concrete plinths. From observation so called “open space” funds are spent on concrete and buildings , which often require car parking and further stealing/by HARD SURFACE sealing of green grass and yes you guessed the answer…USUALLY LESS OPEN SPACE. Absolutely correct, by the two definition on how to calculate public open, by the amount over the population or by just the square hectare; Glen Eira is going backwards. Our hero councillors just fiddle away like there is no tomorrow, it’s sad how such intelligent people can be so uncaring and or incompetent at almost every that’s put before them. Council counts as “public open space” land that the public is prohibited from—a very perverse outcome. In the future roads, and transport corridors more generally, will be counted as public open space, henceforth to be called “linear parks”. Council have relied on 42 odd participants who responded to their survey to justify spending $12m on a multi storey car park!!!! Surely some of the new councillors should be asking for more public debate but no they have what they want and they will spend irrespective of what the majority of the public want. ALL of the current councillors know in their heart that if they we to put this to the vote it would fail; they also know that the public are against major capital spend increases but some of our councillors like the idea of a plaque to commemorate there time on council.